If you’ve worked on a construction site, you know that site safety is of the utmost importance. When employers don’t uphold their responsibility to maintain safe working conditions, accidents can occur, often resulting in serious neck, back or spinal injuries. Construction ladder accident cases are fairly common in the New York courts, and you’ll want an experienced lawyer on your side. 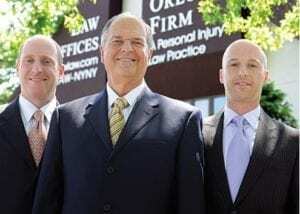 At The Orlow Firm, you will work with experienced Bronx construction accident attorneys who truly care for our clients. We have helped thousands of clients obtain the compensation they need after serious injuries, and we understand that a fall, even one that seems like an accident, may actually be the fault of your employer, a manufacturer or another employee. We bring professionalism and insight to construction accident cases. Call (646) 647-3398 or contact us online for a free consultation with an experienced lawyer. We serve clients throughout New York City. Companies have a responsibility to properly maintain ladders that construction workers use on a daily basis. When they fail to take proper care of equipment, workers’ lives are at risk. Falling from ladders can cause serious injuries. While workers’ compensation may help mitigate your situation, you may in fact be entitled to more money than you realize, especially in a case where there was negligence on the part of the construction company for not properly maintaining its ladders. When you contact us after a fall from a ladder, we can refer you to a skilled workers’ compensation attorney. We will also determine whether a third party may be liable for your injuries. We will investigate your case to determine whether the ladder used was adequate, maintained and safe, and we will look at other factors that could have led to your injury. We have represented numerous victims of ladder accidents and can show you how to seek fair compensation for your injuries. Once you call us for a consultation, we can begin this crucial fact-finding process.